Van hire to Spain is a viable option, if you use a reputable, professional company to do it for you. They will be able to pack the van properly, and drive it safely, due to their experience and knowledge in the sector. As an individual, you might have difficulties, and it is important to be aware of potential pitfalls. Most of the vans that you will be able to hire for removals to Spain on your standard UK driving licence will be able to hold a maximum of 1,000kg. This may sound like enough, but is really only 40 well-packed boxes, not to mention any furniture. And you must also take into consideration the weight of the driver and passenger. If you are only moving a small amount, then van hire Spain might get all of your possessions to your new home in one trip. But if you are moving lock, stock and barrel, then it is likely that you will need to make a number of trips in order to bring over everything that you are not storing. These boxes may only take up half the space of the van, so it may seem as though it is entirely possible to put more items inside, but if you do this you are liable to be overloading the vehicle. This is illegal, and if you are pulled over the by the police you will be in trouble, resulting in a fine and points on your licence. As well as ensuring you are not overloading the van for your trip from the UK to France, you must also make sure that everything is loaded safely so that it won�t fall over in transit. The weight must be evenly distributed. 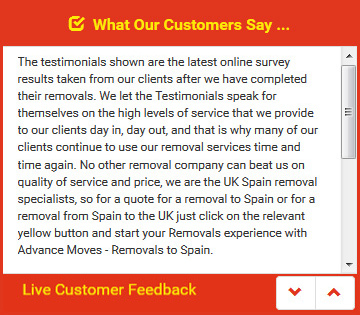 Think twice before you commit to van hire to Spain; hiring a professional removal company such as Advance Moves will be quicker, easier, and less expensive than doing it yourself. See our website (http://www.advancemoves.com/) for a quick quote, or contact us on 0871 218 0612 or email info@advancemoves.com.